Update 4/24/19 – Week 2 is here and HobbyDB along with GeePeeKay have launched card #2. This week’s card is a Bruised parallel. This dark blue bordered card is numbered out of 400 on the back. In order to be eligible to purchase this week card, collectors must add 10 items to their wishlist on their HobbyDB account. Complete details can be found at their blog. Once the task is complete the card can be purchased fro $8.99, shipping is free. Collector’s who didn’t get last week’s card still have a chance as the website shows there is still some available. HobbyDB and GeePeeKay today announced they have launched an exclusive Art by John Pound sticker card collection. The first card is available for sale today at HobbyDB’s website. 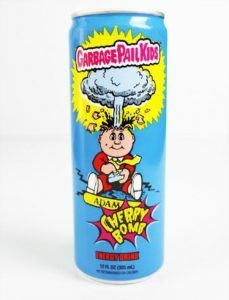 The officially licensed Topps card features the Adam Bomb concept artwork by John Pound. The company is planning on launching one card per week over the next six weeks. The first card is called the White Border Variant and is limited to 1000 copies. Every Wednesday through May 22 a new card will be made available for purchase. Each week the print runs get smaller, with the last card only having a print run of 50. While the first card won’t be numbered, the remaining cards will all be limited and numbered on the backs. This is the first officially licensed Topps product from HobbyDB. If you recall a few months back, the company asked for input on a possible high end licensed Adam Bomb statue they were working on developing. On Monday in a release on their website the company stated that plans for the statue were on hold. They said, “Although we would have loved to offer a statue, as originally planned, a cost explosion of Adam Bomb proportions would have run up the retail cost of the collectible to somewhere between $400 and $500. 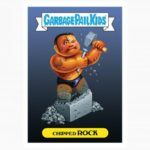 We haven’t given up on the idea, but we’re equally, if not more, excited to offer the opportunity to own a unique piece of Garbage Pail Kids’ nostalgia.” If the Art by John Pound sticker collection is successful the company has other ideas they want to explore with collectors. Head on over to HobbyDB’s website to get all the details and links to signup and purchase the cards. FYE isn’t stopping at just energy drinks. 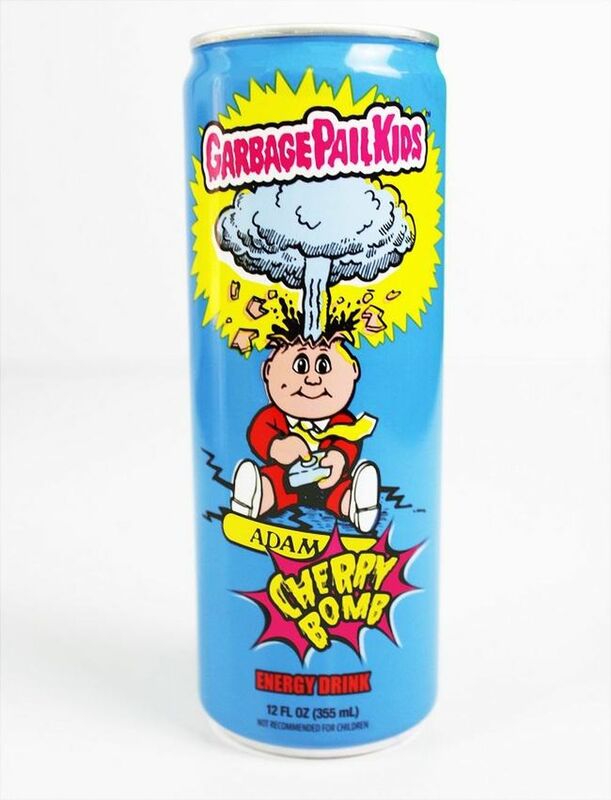 Coming off their launch this week of Adam Bomb energy drinks, the entertainment chain is planning on more officially licensed food related Garbage Pail Kids launches. 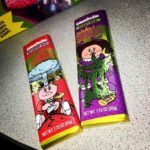 According to the @fyekandy Instagram account there will be GPK themed candy bars and cereal coming soon to FYE stores. GeePeeKay was first to report the news on their Facebook page. 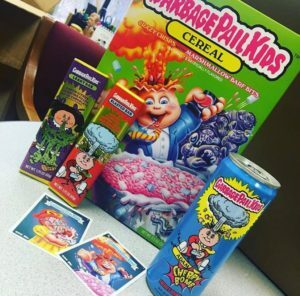 The cereal features a number of characters on the box led by Adam Bomb, and promises crazy crisps and marshmallow barf bites. Each box says it contains two exclusive trading cards. Another picture on the instagram page shows the cards as being Adam Bomb and Ghastly Ashley in cereal themed artwork. 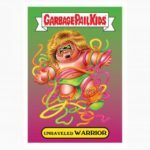 Veteran GPK artist Joe Simko completed the artwork for the box and cards. There looks to also be two fruit flavored chocolate bars coming. One is a Blasted Bar featuring Adam Bomb, while another is the Leaky Bar, with of course Leaky Linsday. The new items should be hitting FYE stores sometime in May. 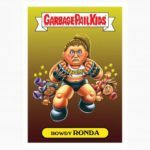 Have you ever wondered how well professional wrestling and Garbage Pail Kids would do if they were combined? 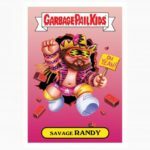 Topps has revealed the print run for their 13 card GPK x WWE crossover set. The set featured only single cards, (no a/b names), and the artwork was also used on t-shirts sold at WWE.com and Spencer’s. The set struck a cord with collectors and had the highest online sales since 2016. The set ended up selling 1028 copies. This is the third highest online sales ever for a GPK product, just behind the first Disgrace to the White House card, and the initial Iowa Caucus online set. These sales numbers blow away any holiday or political sets Topps has done the last 4 years. 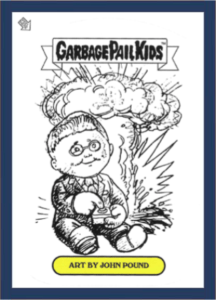 2019 has proven to be a very successful year so far for Topps GPK online. 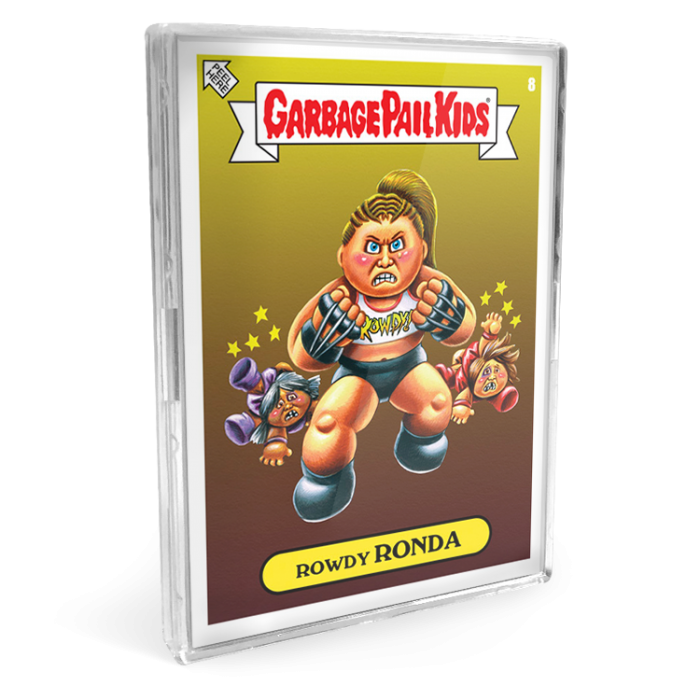 Between the coloring book, on demand sets, and the WWE set Topps is selling more GPK online than they ever have before. With numbers like these I would expect future GPK x WWE crossover sets. As part of the release, Greenlight released the flat artwork for the cars. 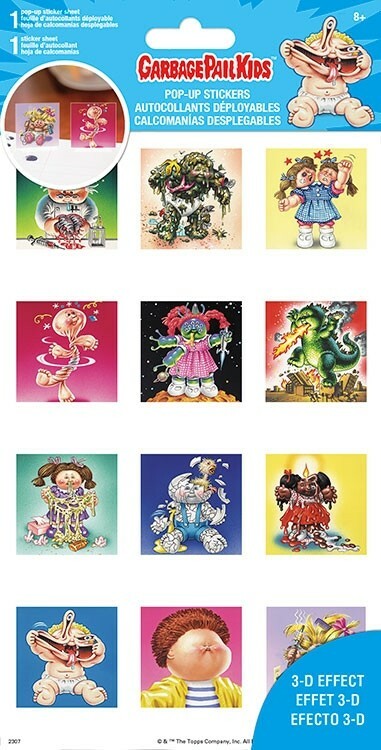 Some of the pictures show bits of artwork making the cars themed GPK. 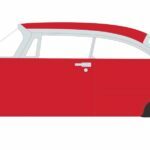 A spokesperson for the company tells GPKNews that there will be additional artwork on the license plates, bumpers, hoods, etc. The flat artwork released doesn’t yet show all the details. Expect final pictures of the cars as the release nears. The company confirmed that the packaging will feature Junky Jeff as the logo. 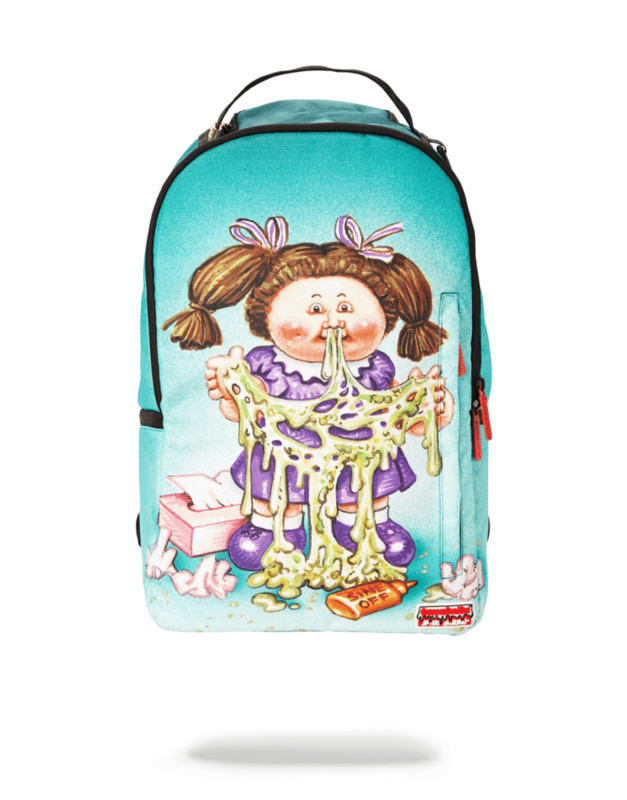 Additionally, each package will come with one GPK sticker. 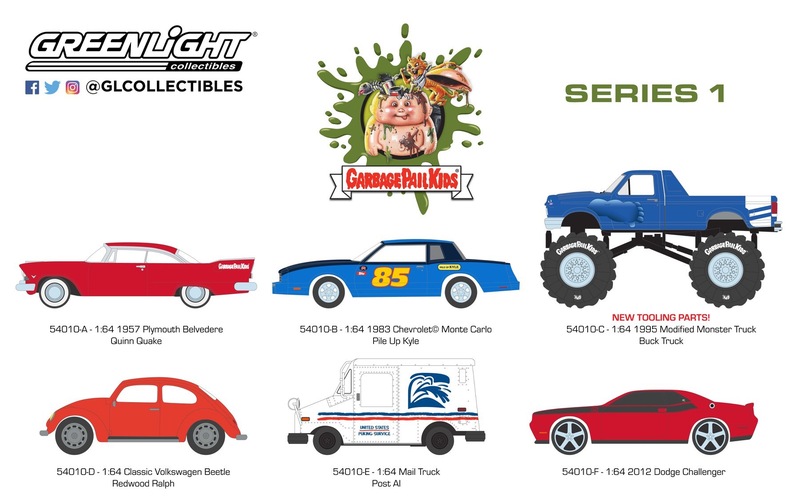 Five cars will feature past GPK characters with vehicle tie-ins, while the 2012 Dodge Challenger will come with a brand new sticker with artwork painted by GPK artist Joe Simko. Finally, randomly inserted into cases of the product will be the “green machines”. These are the chase cars for the company. These are cars that feature green traits on the cars, like green bodies, green chassis, green tires, etc. 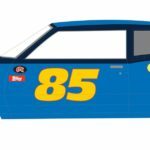 The company has not yet revealed the rarity of the green machine chase cars. 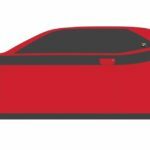 The cars are already available to pre-order from various online retailers. 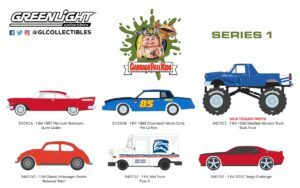 Greenlight Collectibles Garbage Pail Kids Series 1 die-cast car set is set to be released this August. 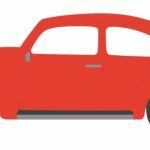 Here is the checklist of cars along with their “GPK” name. Update: Do you like Clogged Duane? Do you live in Kuwait? 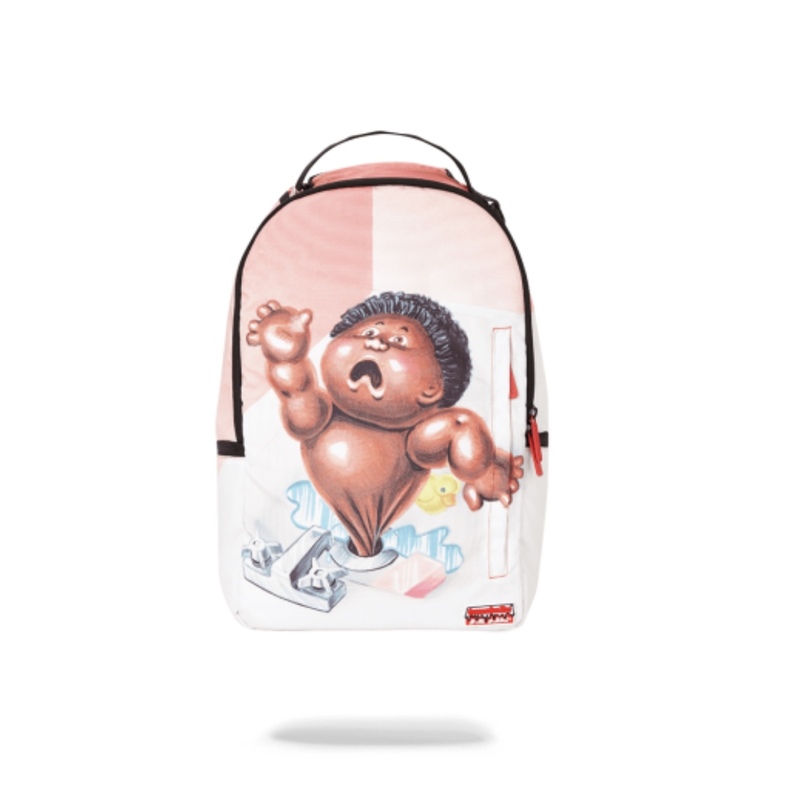 Then head over to Sprayground’s Kuwait website for the third different GPK backpack to surface. Topps continues to put that Garbage Pail Kids license to work. 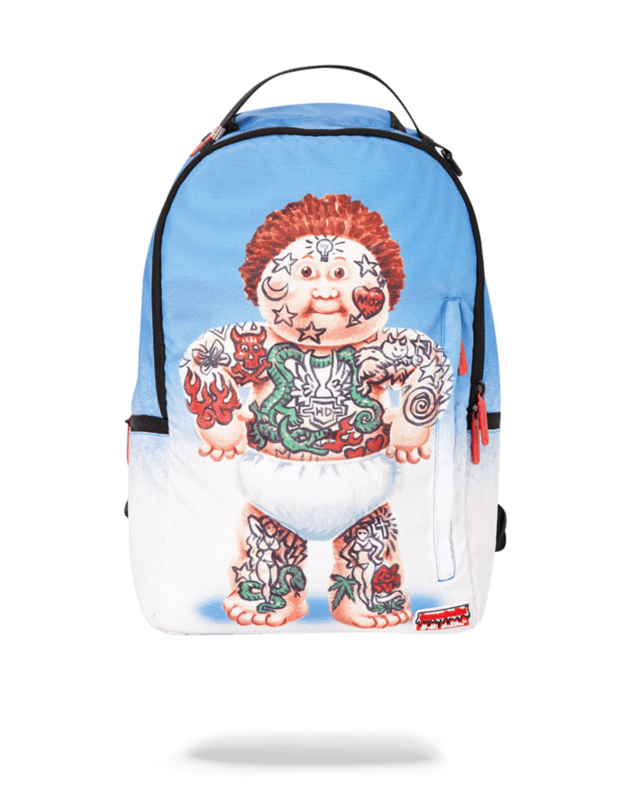 Yesterday Sprayground launched two new licensed GPK backpacks. 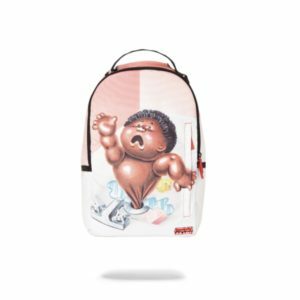 Sprayground is a designer brand focusing on creating both original and licensed backpacks. 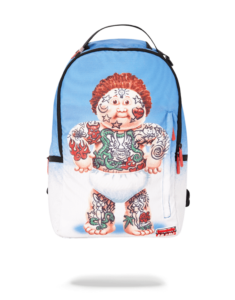 The backpacks feature OS 2 characters Tattoo Lou and Leaky Lindsay. They measure 18″ x 6″ x 11.5″ and are available for $65 each at Sprayground’s website. 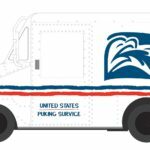 Shipping is free or orders within the US. Customer’s can get a 10% off coupon for signing up for text ads on their website. 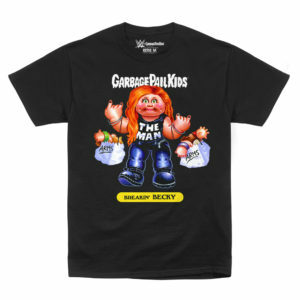 This isn’t the first time GPK can be found on designer items. 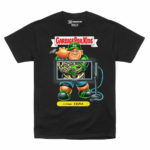 Last year Opening Ceremony offered a line of designer GPK shirts and hoodies. There are sure to be more licensed products on the horizon in 2019. 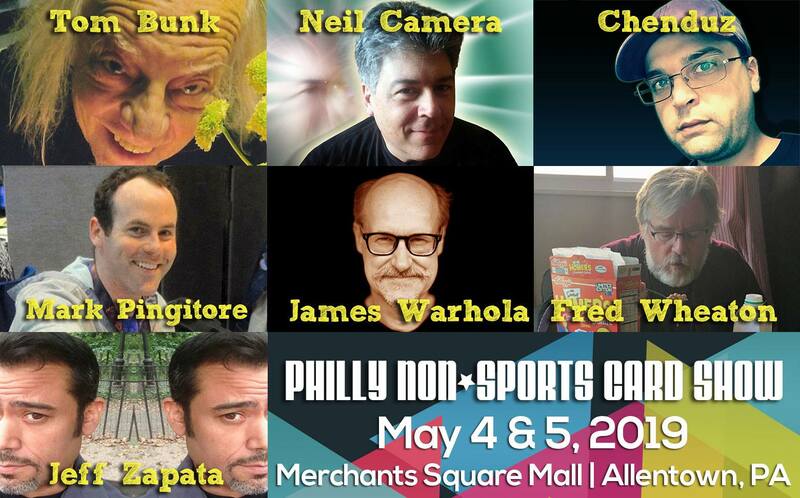 Just like clockwork, the next Philly Non-Sports Card Show is coming up in just under six weeks. 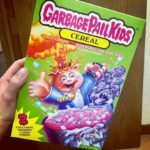 This will be the 70th show, and much like the 69th, the show will once again focus on Garbage Pail Kids and Wacky Packages. The show takes place in the Merchants Square mall in Allentown, PA twice a year. The spring show is scheduled for the weekend of May 4-5, 2019. The show is the largest non-sports card show in the US and features dealers selling a wide variety of non-sport products. Once again, there is a stellar lineup of current and former GPK artists scheduled to attend. The group is led by original series artist Tom Bunk, and also includes previous attendees Fred Wheaton, Jeff Zapata, and Mark Pingitore. Three newcomers to Philly will also attend including original series artist James Warhola, Neil Camera, and Vincenzo “Chenduz” d’Ippolito. Chenduz will be making his first east coast appearance all the way from the Netherlands. There is a lot of history and knowledge from OS and ANS days. All the artists will be on hand selling original art, prints, sketches, cards, and more. Show goers will also receive a promo card from Magic Marker Inc. (Pingitore). Prior to the show opening on Sunday there will be an artist chat. Be sure to register with the show prior to the chat. This is a great opportunity for collectors on the east coast to meet and support their favorite artists. As with all Philly shows, there will of course be promo cards. The theme from the previous show will carry over to this show as well. All show attendees will receive a card from Brent Engstrom. The card is a different version of the Toser the Destroyer card from the previous show. This card will have a slightly different background, be numbered 1b, and named Roxanne Recon. Show goers attending Saturday and Sunday will receive a different card from Neil Camera each day as well. The usual Saturday night dinner will take place at the Ratz room inside the show hotel the Hilton Garden Inn. All guests attending the dinner will receive the next two official Topps promo cards, #3 & #4, in the Philly Non-Sport set. These two cards, one GPK and one Wacky, were painted by Layron DeJarnette and Chenduz and feature a spring theme this time. Dinner attendees will also receive a special card painted by Tom Bunk. The cost of the dinner is $19.95. Tickets are almost sold out for the show dinner, so act fast to reserve your seat! To reserve your spot contact Roxanne Toser at roxannetoser@gmail.com. The Philly Non-Sports show is a show geared not only for collectors but for families as well. The first 20 kids into the show will receive a package including an assortment of stickers and cards to get their collection started. Show organizers are also planning a box break of GPK and/or Wacky’s. Participants purchasing a spot in the break will be randomly assigned a number to to pick special cards from the break. Show tickets are available for $8 per day, or a two day pass for $14. The show will be open from 10:00 AM – 5:00 PM Saturday 5/4, and 10:00 AM – 3:00 PM Sunday 5/5. East coast collectors this is your change to chat with artists and fellow collectors in person. For more information on the show check out their website. Trends International looks to be a fairly new company to the Garbage Pail Kids license with Topps. They first launched posters found in Wal-Mart and on Amazon of OS 1 and OS 2 cards. 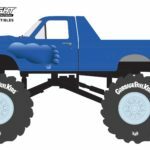 Now comes word of two new sticker products from the company. The company specializes in licensed merchandise such as posters, calendars, stickers, etc. The first new product is called Pop-Up Stickers. 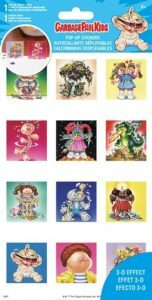 Coming two sheets to a pack, these simple sticker sheets have numerous classic OS characters on them. Thanks to collector Johnny Nichols for first sharing these spotted in the wild. They were purchased from their local Five Below store. The Trends International website states the product is suppose to launch on 5/2/19, but it looks like some stores are putting them out early. The second product from Trends is the Sticker Flip Pack. The packaging on the website shows the pack will come with 6 unique sheets of stickers. 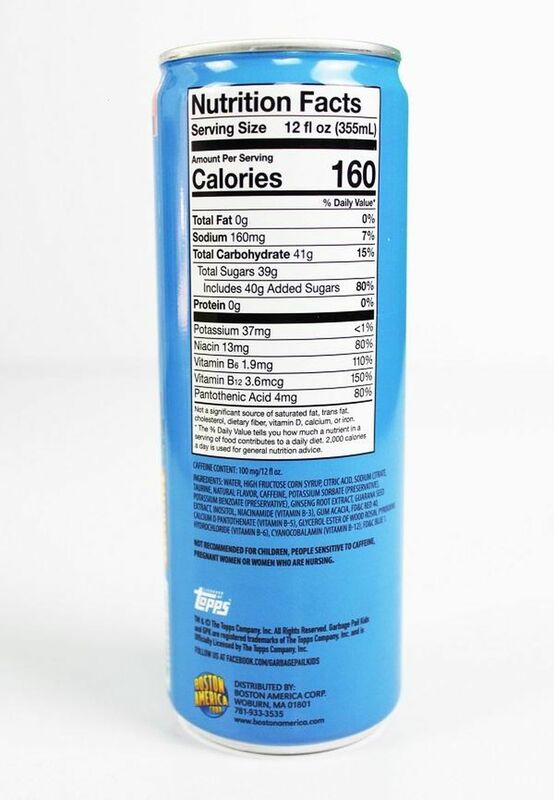 This product just has a “coming soon” listed as the release date. Expect to see these pop up where licensed stationary products are sold in the coming months. 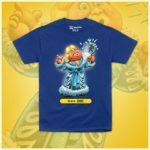 Fresh off the announcement by WWE this morning of shirts being available at wwe.com and Spencer’s gifts, Topps decided to launch their wrestling themed GPK set a day early. 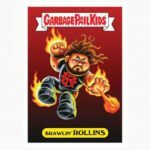 Today Topps launched WWE X GPK 13 sticker online set. 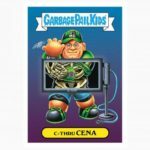 The set features 13 cards of past and present WWE superstars turned into GPK characters. Joe Simko and Brent did all the artwork on the cards. The cards have numbers and the “peel here” arrow on the fronts. Unlike a traditional GPK set each character only has one card. The WWE announcement from today said the cards would launch on Mar. 12, but it looks like Topps decided to get the ball rolling a day early. The set is available for $24.99. Shipping is free in the US, while international shipping varies. It will be available for 29 days at topps.com. Topps will reveal the print run at the end of the sale. Here is the checklist and pictures from Topps & WWE of the cards. 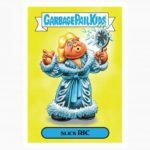 WWE is teaming with ’80s icons, the Garbage Pail Kids, to give a new look to your favorite WWE Superstars and Legends. 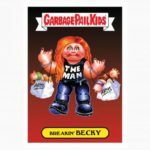 Superstars like Becky Lynch and Ronda Rousey will get a GPK-style makeover for a new line of T-shirts and hats on WWEShop.com and Spencer’s. 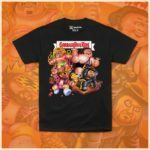 WWE x GPK tees with “Stone Cold” Steve Austin, Randy Savage, Ric Flair, The Undertaker, The Ultimate Warrior and Andre the Giant will be available at Spencer’s starting March 21. Collectible trading card packs will also be available for ordering on Topps.com, starting March 12. Get your hands on “Breakin’ Becky,” “Brawlin’ Rollins” and more, available now! Here are preview pictures of cards and some of the shirts from WWE. 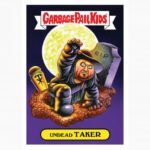 Topps is expanding their licenses with WWE (World Wrestling Entertainment) and Garbage Pail Kids. 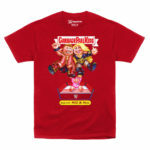 Today the WWE launched officially licensed Garbage Pail Kids shirts. The five new shirts feature artwork done by Joe Simko and Brent Engstrom. The shirts parody some of the biggest names in wrestling, Becky Lynch, John Cena, Seth Rollins, Rhonda Rousey, and the Miz. Each shirt is available for $27.99 and comes in sizes S-2XL. 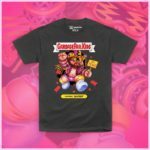 The shirts can be purchased on wweshop.com. No word yet if the shirts will be available at merchandise stands at shows.